Click the picture at left to enlarge. Rambulance flies dispute the "Fuzz on a Hook" theory! "It's all just fuzz on a hook," is how Mark Bachmann responds to most flies, especially new, untested varieties. In today's commercial fly world there is something to be said for a statement like that. Working for a commercial fly company myself, I am sure there are more than a handful of flies each season that make catalogs without having had the chance to get wet first! The difference in my world of fuzz on a hook and a fly worth talking about is: I don't like to even name a fly until it has taken fish. With that said, I have a hard time staying tuned into a certain fly, even of my own creation, until it produces consistently, on different waterways, in different times of the year for steelhead or trout. Past that, if it is aesthetically pleasing and easy to cast, now we're onto something worth talking about! Tying a fly to me basically means wrapping common sense, experience, and trial and error around a hook (in this case a tube). Sometimes it is an involved process going through stages of development and some trial, other times it is simple. After all, steelhead eat pink rubber worms, right? The Rambulance started shortly after (and I mean as the credits were rolling) watching an OPB program back in 2009. Long story short, biologists and OPB crew members wanted to watch the spawning habits of Oncorhynchus Mykiss to see if that information would yield any clues to the protection and ongoing efforts to restore the numbers of our beloved steelhead in the P.N.W. Being able to observe what happens in the wild with humans mucking about was impossible. The solution: specially designed waterproof cameras strategically placed around pre-spawn and spawning habitat where the fish would act like fish without the interference of man. The video results were amazing. 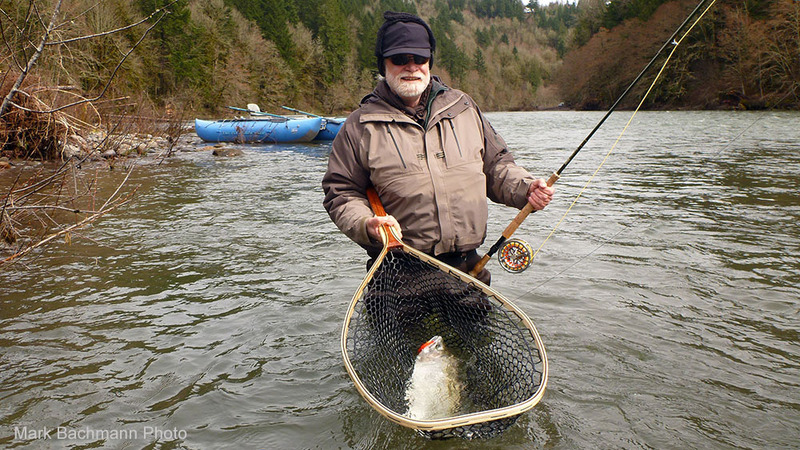 In particular, a group of "sneaker fish," as OPB termed them, worked in teams to agitate and move steelhead. 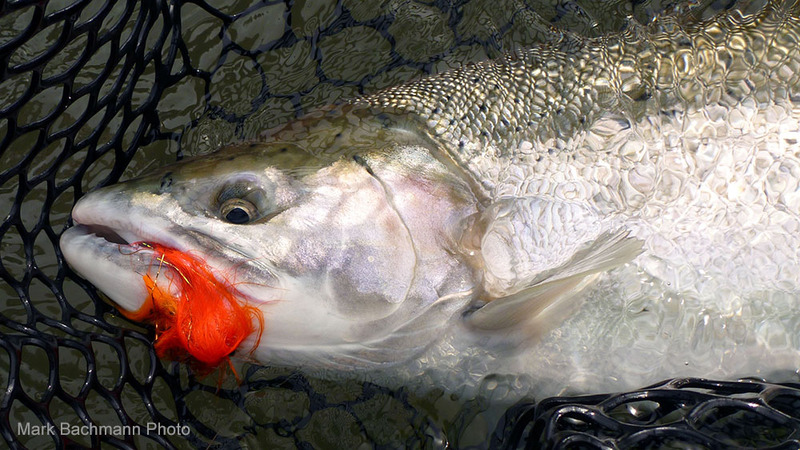 The male steelhead took the bait multiple times moving off his bed to chase off potential competition. The male obliterated one sneaker, later on giving chase to another, while a third 9-inch fish ducked under the adult female and took care of the job of inseminating the eggs. Wow, small immature looking trout are sexually mature? Steelhead hate these little sneakers? Man, I bet if I can imitate them in basic size and shape, I can catch a lot of fish off the spawning beds of course!!! O.K. show's over, I wish I would have recorded this one, now off to the tying room. Meanwhile, like most other fisherman chasing steelhead, I was taken in by the Intruder from the first time I saw that fly in Dec Hogan's Passion for Steelhead book. I already had a box loaded with varying flies from 3" to about 7" long. I found the rabbit infested flies (among other materials) hard to cast at best (almost impossible in tight casting lies). In open water where you could make a full D-loop, the soon to be doomed to the garbage can flies would lazily waffle their way out mid stream. I also felt like a lot of flies were in a constant struggle. What struggle is that you ask? The struggle was loads of Rio T14 trying to get a fly down, but the flies and the way they were tied were not having any part of going down. Kind of like eating candy for a sugar high and drinking beer all at the same time, just don't work! This fly was going to be different: large-profile, colors that will represent these fish, easy to cast, a fly that will allow the tip to get it to desired fishing depth efficiently, and tied on a tube. That way, if the hook becomes fouled or the gap opened up it would be quick and easy to replace the hook and keep the fly. Sounds easy, right? Actually, it was easy! 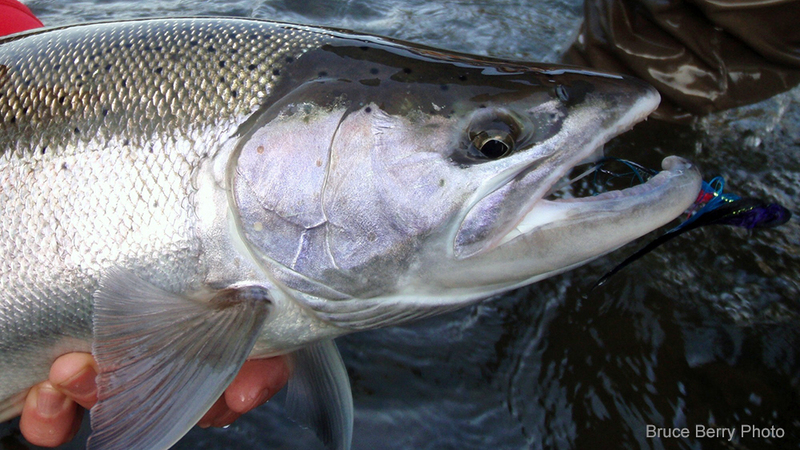 The first attempt just showed that the wing lengths needed a little tweak in order to keep it's wiggle and boogie from the softest to the hardest currents where you would normally encounter steelhead with a fly. From there, I tied it with Iceland Sheep, Arctic Fox, Temple Dog, Finn Raccoon and Craft Fur. I settled on Craft Fur simply because the dyes were consistent and color fast. At the end of the day you could stuff the wet flies in a jacket pocket so the next time you use it there is not really any color transferred to the jacket. Also, the material would not take a set, becoming bent up in all sorts of contorted angles while drying out and riding around in my jacket, hip pack or boat bag. The alternate materials that come in a close second tying my Rambulance are Finn Raccoon or Marble Fox. The wings wiggle in all currents adding realism to the fly and keeps the fly tracking across the runs properly. The fly is forward weighted so it rides level in most all fishing situations. The overall fly size is, I believe, perfect for most water conditions to take fish consistently. Rambulance is easy to cast when paired with a Skagit line and sink tip, it does not feel like you have much more than a size #10 Adams on the end of your line. When developing these flies I figure if it cast nicely on a Scandinavian line taper, then it will be awesome on a Skagit set up. Alternate color: Orange, really good for fish fresh into a system. Pro Tubefly Systems had just become available in the U.S. market which made it even easier to develop the Rambulance. The weighting systems, tubes, metal and plastic cones all come in lots of sizes and great colors that allow simplicity in modern fly design. Kind of like Lego's for big kids. The other morning the river was high and pea green with snow melt; my favorite water condition. My buddy Bob tied on his modified Egg Sucking Leech, he calls it Arnold. 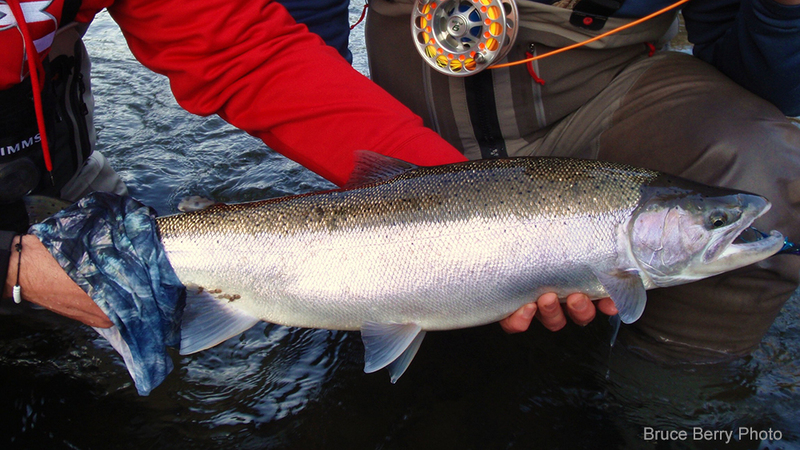 Arnold had been a strong producer of winter steelhead all season. I assembled my rod as Bob worked his way downstream from the boat. I chose Bruce Berry's orange Rambulance fly, waiting until Bob had covered the first 50-yards, Then I waded into the river to follow him. This Rambulance is mostly hot orange, but has a strip of even hotter orange craft fur running down the center of the wing. We call this color Hot, Hot: the perfect color for a snow-melt river. The third cast brought the Hot, Hot Rambulance fly across the the river deep and slow, broad-side to the current. There were three distinct tugs and then the line became real tight. Then the fly came free for no apparent reason. Two more steelhead came to the fly, and the last one finally made it to the net. Bob asked, "What are you using?" "I'm using this orange Rambulance fly. It has great color, and boy does it boogie in the water. Look at this!" I dropped the fly in the water and it writhed and wiggled with life. "Here, do you want one?" I handed him a zip-lock with half a dozen in it.